Fixes couple of annoying things in tavern worker's behavior. Changed recomendations for Go to bed from "compatible" to "should be placed higher". Added patch for Extended Stay. 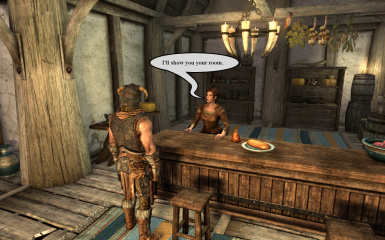 This mod fixes some things in behaviour of tavern workers, which looks unnaturally or cause annoyance. Waiters will serve you only if they are able to see you. Talen-Jey will not bother you any more offering a drink when you sit in your room on second floor. Innkeepers will show you rented room only once, and next time you can ask them to show the room if you accidentally forgot where it is. Originally innkeepers will show the room each time you rent it, despite that it is always the same room. set TAIF_ServePlayerEveryTime to 1 - waiters will serve you more than once per visit (every time you sit). set TAIF_ShowRoomNeverShow to 1 - innkeepers will never show rented room. Immersive Citizens - AI Overhaul - compatible. Perseids Inns and Taverns - Realistic Room Rental Enhanced - compatible. Go to bed﻿ - should be placed higher. Become a Bard - patch available in Optional files. Extended Stay﻿ - patch available in Optional files.